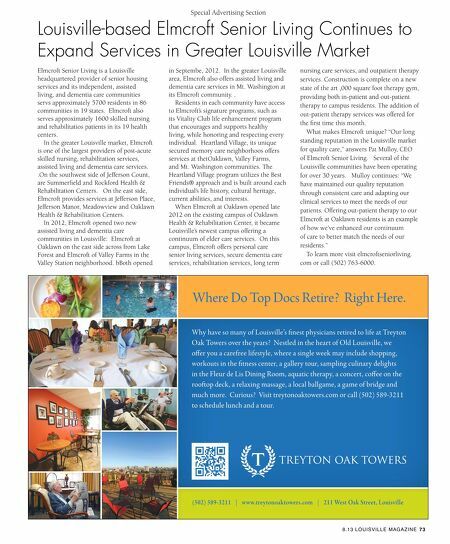 Special Advertising Section A Lifestyle You'll Love at Treyton Oak Towers www.phsk.org 72 LOUISVILLE MAGAZINE 8.13 Nestled among quiet, tree-lined streets in the heart of Old Louisville, Treyton Oak Towers offers a retirement community with a tradition of compassion, comfort and care spanning nearly three decades. Located at 211 West Oak, Treyton Oak Towers blends timeless elegance and modern convenience. Visit the tastefully appointed dining room and you'll feel as though you're in a sumptuous fve-star restaurant. Winter may fnd you lost in a favorite book in the library or chatting with a friend beside a cozy freplace, while summer beckons you outside to relax in the shade beside a refecting pool. Treyton Oak Towers redefnes retirement, with events and amenities designed to engage even the most active person. Residents enjoy a fully-equipped ftness center with instructor, a beauty salon, a massage suite, a private dental practice, their own bank branch and ATM, computer and wireless internet access, lovely guest suites, a greenhouse and a rooftop deck with a breathtaking view of the city. The calendar is brimming with activities, from lectures in the ballroom and aquatic therapy sessions to excursions for shopping, dining, art and theatre events, holiday galas and more. But the heart of Treyton Oak Towers is a caring staff that is truly devoted to anticipating and meeting the needs of every resident, amid a community where old friendships can be relished while new relationships blossom. With a continuum of care that encompasses everything from independent apartment living to skilled nursing care, the team at Treyton Oak Towers is uniquely equipped to enhance every stage of life. 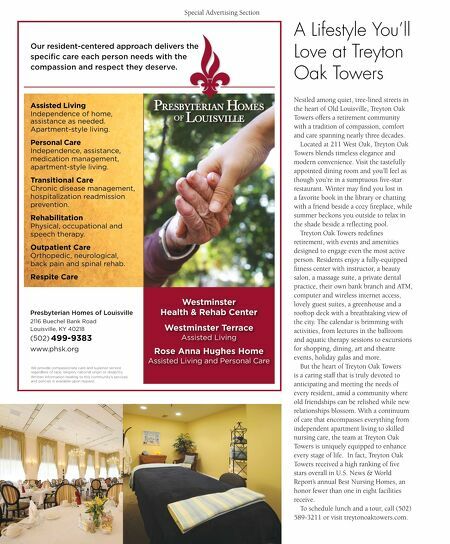 In fact, Treyton Oak Towers received a high ranking of fve stars overall in U.S. News & World Report's annual Best Nursing Homes, an honor fewer than one in eight facilities receive. To schedule lunch and a tour, call (502) 589-3211 or visit treytonoaktowers.com.